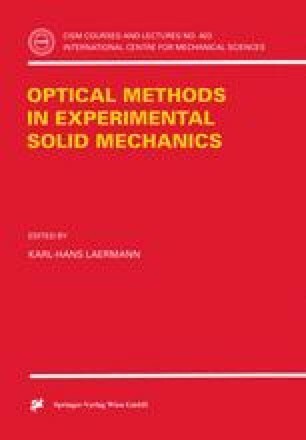 Optical methods in experimental solid mechanics, yielding field information, combined with digital image processing and on-line evaluation of the experimentally obtained data by means of numerical procedures enable the stress-strain analysis of many problems, which couldn’t be analysed satisfactorily as yet. Thus the effects of non-linear elastic, of viscoelastic material response and of any combination of such materials on the stress-strain state can be considered. Hybrid techniques, i.e. the combination of measurement techniques with numerical methods for data evaluation based on advanced mathematical algorithms yield reliable knowledge on the actual state and the real reactions of any kind of structures.. As the originally obtained experimental data generally do not meet the finally wanted information these pre-processed and digitized data are to evaluate by numerical procedures like the boundary-integral method and its discrete modification, the boundary-element method or the finite-element method.